HOW TO HANDLE the heat wave this week. As if you didn’t know, it’s hot and going to get hotter. Temperatures in the West Orange County area will reach deep into triple figures on Friday and stay quite warm through Sunday. 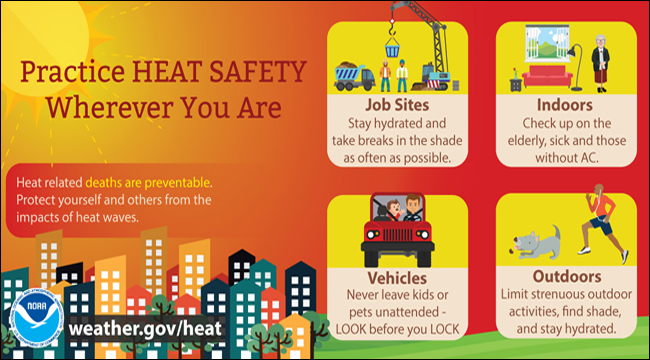 The National Weather Service has issued an “excessive heat warning” for the region. Garden Grove: 110 on Friday, 98 on Saturday, 92 on Sunday. Huntington Beach: 98 on Friday, 88 on Saturday and 84 on Sunday. Stanton: 108 on Friday, 96 on Saturday, 91 on Sunday. Westminster: 108 on Friday, 93 on Saturday and 87 on Sunday. Residents are advised to avoid too much exposure to the sun and heat. Seniors, children and pets are especially at risk from the dangers of the weather. Stay hydrated! Garden Grove’s Senior Center (11300 Stanford Ave. from Garden Grove High) will serve as a cooling center on Friday from 11 a.m. to 5 p.m.; from 11 a.m. to 3 p.m. on Saturday and 11 am. to 5 p.m. on Sunday.